This cabinet was probably made for a Dutch Company official serving on the Coromandel Coast or in Ceylon. 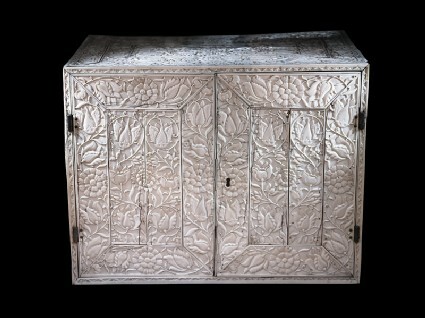 Its surfaces are composed of multiple ivory plaques, carved in low relief with a bold floral meander pattern. This large-headed flower design is closer to the European taste than to the local decorative repertoire. Bequeathed by Mrs Martha Combe, 1894. Like [EA1976.6] this larger ivory cabinet would have been made for a European (probably Dutch) patron, at one of the trading settlements on the Coromandel coast or in Ceylon. Furniture of this type was made for everyday use rather than export, but a number of examples were brought to Europe as gifts or by retiring Company officers returning home. 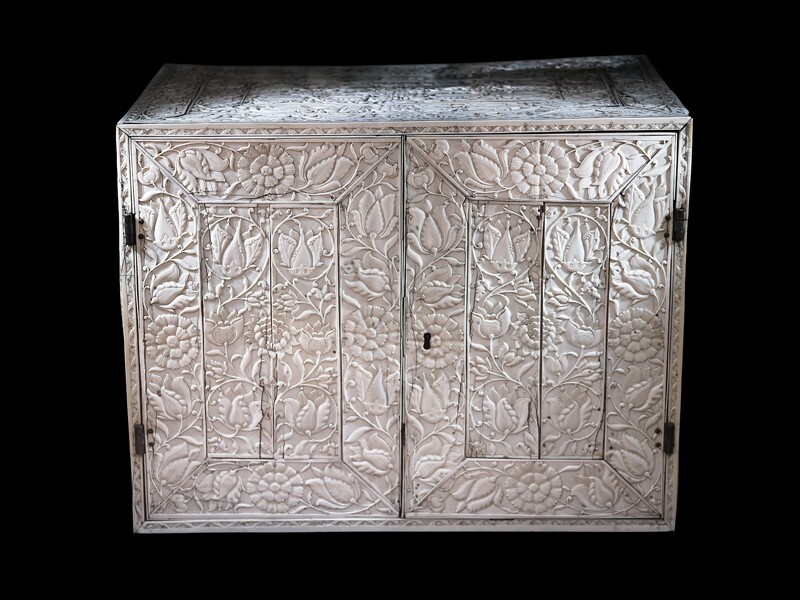 The top, side and door panels are made up of multiple ivory plaques carved in low relief with a bold floral meander pattern. The inner sides of the doors and the eight internal drawers are similarly decorated. The luxuriant large-headed flower decoration is much closer to the European taste than to the sparer, more formal Mughal floral ornament of northern India. A larger and more elaborately carved ivory cabinet of similar type, now in the Victoria and Albert Museum (I.S. 70-1959), formerly belonged to the artist William Holman Hunt (1827-1910). It is reported that the present cabinet was also found by Holman Hunt in London, and was purchased on his advice by Mrs. Combe, who later bequeathed it to the Museum. An ivory box in a comparable decorative style is in the Archaeological Museum, University of Peradeniya, Sri Lanka (von Lohuizen-de Leeuw, loc. cit. ).